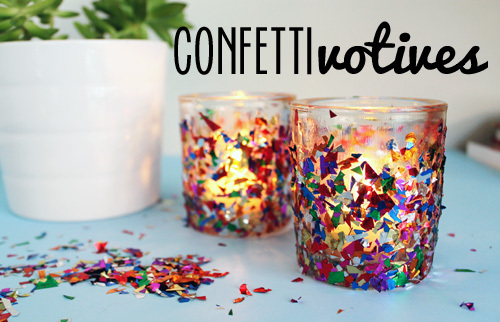 For this project you'll need glass votive candle holders, confetti (or glitter! ), Mod Podge, and a paint brush. You'll also need something to lay your glitter out on. 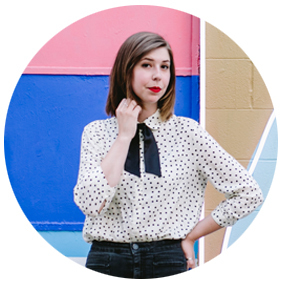 Spread out your confetti on a flat surface. Cover about a third of the glass votive with a thin layer of Mod Podge. Start from the bottom of the glass, and work your way up. I wanted a kind-of ombre effect, so I didn't paint all the way up the glass, but you do as you wish. Roll that section in the confetti and lightly press the confetti down with your fingers. Add another layer of Mod Podge and reroll if you want more coverage, or continue on to the next section. Let sit for 15-20 to start the drying processs. 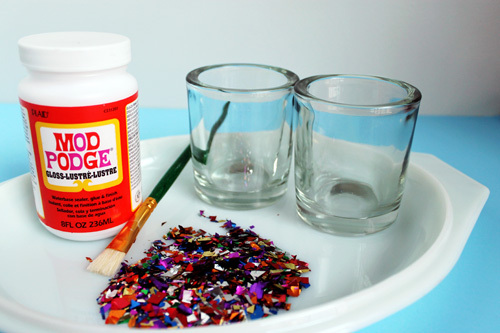 After a bit of drying, add another coat of Podge over the entire glass, pressing down the confetti with your brush. This is also a good time to move any loose pieces around. Let dry completely. And that's it! You could light these little guys up for your next gathering, or they would make darling housewarming gifts!